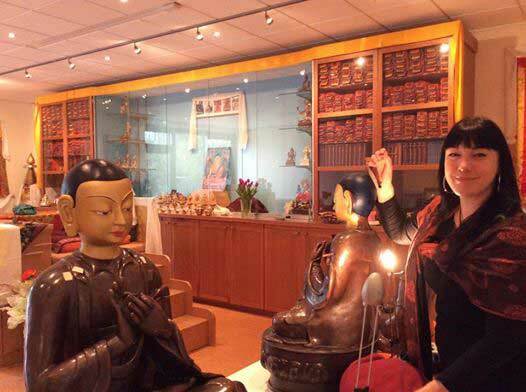 Lama Dagpo Rinpoche recently opened a beautiful new center in The Netherlands called Kadam Chöling. 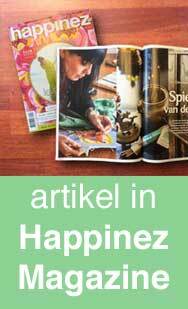 It’s situated in Haarlem, a lovely old city about 20 minutes from Amsterdam. I was asked to make some changes to the faces of 3 large Buddha statues, Atisha, Lama Tsong Khapa and Buddha Shakyamuni. These bronze Buddha statues come from Nepal, are made in the traditional way, and their faces were already painted. But during his last visit to the center, Dagpo Rinpoche noticed some things that could be improved. Both Lama Tsong Khapa’s and Atisha’s hair for example were painted light grey in color, making them look very old! I painted the hair dark blue as it should be. the of Buddha Shakyamuni’s third eye (called ‘urna’ in Sanskrit), had to be changed into a dot to be proper. Though when I write it down it doesn’t look like a lot of work, but together with some other changes it took me a full day, as I’m working with multiple paint layers and more so: because it’s such delicate and concentrated work. After the statues are painted, they will be traditionally filled with mantras, images and special substances (gold, gemstones etc. ), they will be placed on the big altar in the main hall.